Speaking at a forum in Sochi, Russian Prime Minister Dmitry Medvedev has revealed that oil and gas revenues have provided for less than half of the federal Russian budget for the first time, and said the country must focus on reducing its dependence on oil through reforms, stimulating domestic manufacturing and cutting spending. For the first time oil and gas revenues have provided for less than half of the federal Russian budget, said Russian Prime Minister Dmitry Medvedev, speaking at the Sochi International Economic Forum. In his words, the fall in oil prices and Russia's flexible monetary policy are responsible for the trend, but nevertheless it has to be supported even when oil prices return to high levels. According to Medvedev, oil and gas revenues should not be the main source for replenishing the budget, while windfall profits from oil sales should be directed towards sovereign wealth funds. 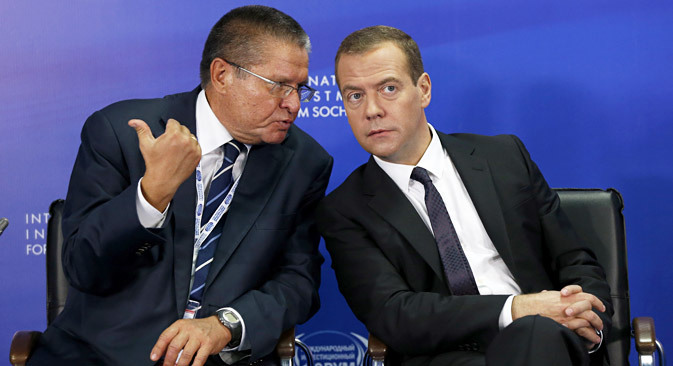 Medvedev noted that many changes have occurred in the world and in Russia's economy in the last year. In his opinion, growth rates in the world remain rather low, even in the U.S. they are lower than experts expected, while the EU is showing zero growth. Medvedev added that the instability in the world economy and politics has had most impact on the positions of developing countries. "The Russian economy is a hostage to and beneficiary of globalization. Russia cannot ignore global trends as it concentrates on its own development." Moreover, in Medvedev's view, "for the last year and a half the Russian economy has had to face unprecedented sanctions from the West and in many cases the sphere of technology has been completely closed to the country." However, the government had known of the consequences the sanctions would have, but still went ahead and made a conscious political decision that led to the EU and the U.S. imposing them. Medvedev announced that Russia has begun involving the expert community to work on a development strategy for the country until 2030. The strategy will have four priorities: investment activity, import substitution, the quality of government administration, and budget policy.